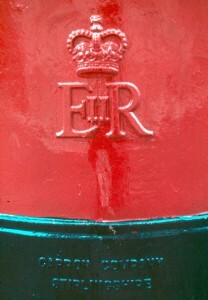 Detail of an English mailbox. Image by Tony Eppstein. 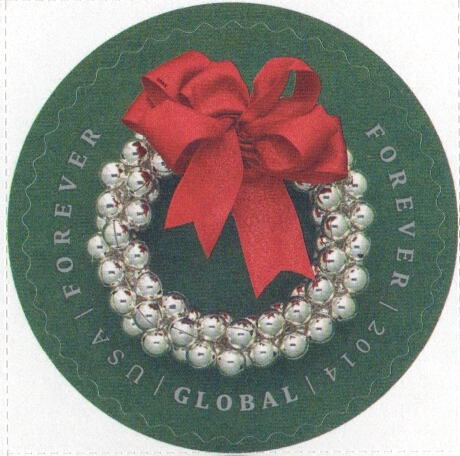 …Hope this reaches you in time for Christmas – along with the other thousands of tons of mail being posted this week. I know – I have to sort the stuff. I am spending the week working in the sorting room at the post office. Very difficult job! – turning the stamps up the right way as the letters come out of the postbags. Have to work pretty hard, but it’s rather fun – very cheerful, friendly crowd – and good money. …I had a very interesting week in the Post Office. Halfway through the week I was promoted to sorting, which was a bit more fun, though harder work than facing up. Those were the days, before email, Facebook, Twitter and other social media, when the annual holiday greeting card was how one kept in touch with extended family and friends. According to Wikipedia the custom of sending greeting cards has a long history, dating back to the ancient Chinese. 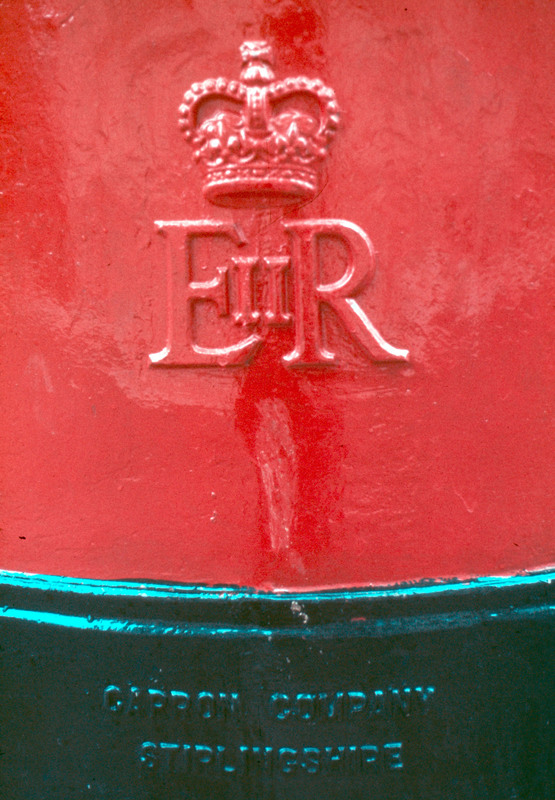 The postage stamp was introduced in England in 1840. Cards started being mass produced by the 1850s. From then on, mailboxes became crammed each December with penned good wishes. A 2014 USPS stamp for international mail. Every card and letter had to be sorted by hand. Mechanical sorting, which depended on reducing the address to a machine-readable form, came in a few years after my stint at the Windsor post office: the 5-digit ZIP code was introduced in the U.S. in 1963, and England’s alphanumeric postcode system in 1966. Communication methods have changed, and fewer greetings now go by “snail mail.” The U.S. Postal Service reports that First-Class Single Piece Mail; that is, mail bearing postage stamps, such as bill payments, personal correspondence, cards and letters, etc., declined by 47 percent in the decade 2005–2014. But that urge to reach out to those we love during the holiday season is still with us. Last week we went to a Swedish party – the St. Lucia festival, I wrote to my parents from England in mid-December 1962. The background of it seems somewhat confused – the story of a saint mixed up with old pagan mid-winter rites. My confused reaction to this experience opened me to the concept of cultural adaptation: the way stories and beliefs from one tradition are assimilated into another. Growing up as a Christian in New Zealand, where the seasons are the opposite of the Northern Hemisphere, I was aware of an odd disconnect in the trappings of our festivals, but as yet did not fully comprehend why this should be. Saffron bread (lussekatter), traditionally served on St. Lucia’s Day. Image from Encyclopedia Britannica. The cattle were slaughtered about Dec. 13 for Christmas, and the women used to come out early in the morning with the men’s breakfast. It developed into a ceremony in which a young girl, attended by maidens and young boys, & wearing a head-dress of candles on her head, goes early in the morning to the homes of people in the district bringing hot coffee. Apparently in Stockholm anyway it has developed into a sort of beauty contest, but in London the Swedes are more Swedish than at home & we saw a more genuine procession of children (the little boys looking very self-conscious) singing charming old Swedish carols, & all carrying candles in the darkened room. Very effective & beautiful. 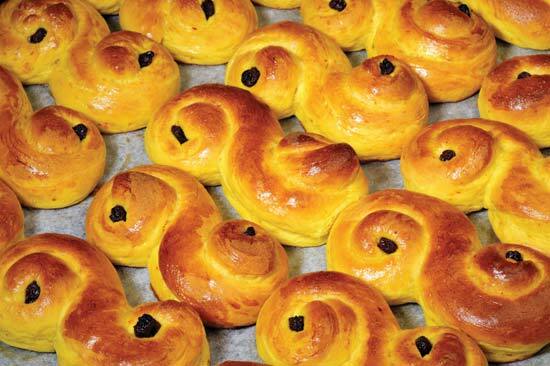 The evening finished with coffee & Swedish cakes & pastries at candle-lit tables. 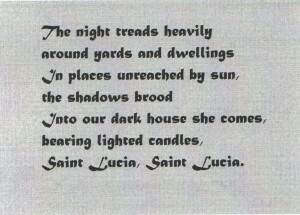 English translation of a St. Lucia Day carol. 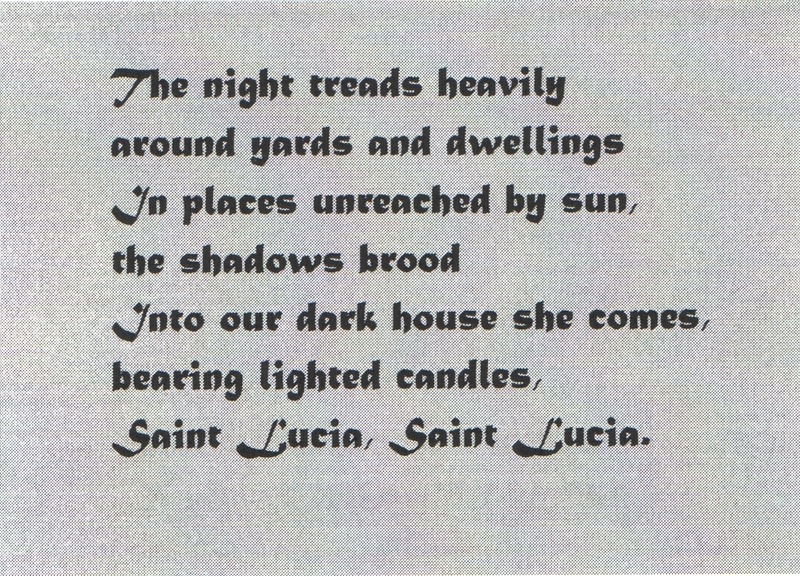 I later learned that before the Christian west adopted the Gregorian calendar in the late 1500s, St. Lucia’s Day fell on the winter solstice, and that it originally honored a goddess who brings the light in the dark Swedish winters. 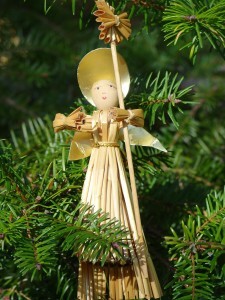 Traces of this solstice celebration linger in the words of the carols sung by the children. The straw angel we bought at the church fair. Battered but loved, she still graces the top of our tree. Our Christmas tree will be decorated with a Swedish angel this year. She is made out of barley straw, pale shining gold pieces neatly tied together. In the early days in Sweden, when the floors of homes were covered with straw to keep out the bitter cold, Christmas guests used to play with the shining straws, plaiting and twisting them into quaint figures. Now Swedish houses are centrally heated, but the custom has persisted, and wherever in the world Swedish people live, at Christmas their homes are always decorated with the golden figures and wreaths. The Swedish community in London recently held their annual church fair, and out came the traditional Christmas gifts and decorations. As well as the charming angels, there were straw animals, goats and horses and dogs, and handsome plaited wreaths for hanging at the door. Other figures were turned or carved out of wood, and brightly painted. 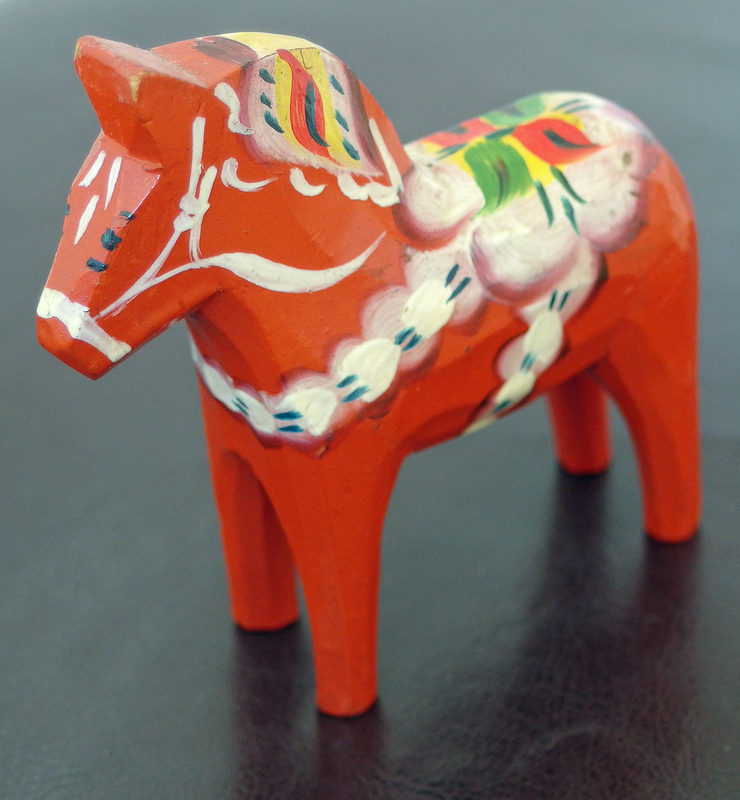 Particularly impressive were ranks of glowing red wooden horses in varying sizes, each painted with gaily decorated harness. Very thin pieces of wood were carved into the tails and wings of formalized birds. By contrast with the tinsel and glitter of English decorations, these traditional designs have a striking simplicity of line and a quaint charm that is refreshing and timeless. Little red horse still has pride of place on a shelf. Maureen is exploring an old black filing cabinet that contains 55 years of her papers and memorabilia.